FACTORY, Copenhagen, Denmark 2003. 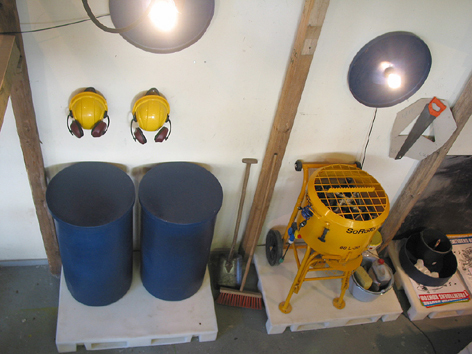 The tools for bending and cutting metal and plastic have been used by different persons to make a kitchen, transport bikes and parts for a silk-screen workshop. Contact N55 at n55@n55.dk to use it. FACTORY gives access to means of production Any person can use FACTORY. FACTORY can be established anywhere and can include any kind of production facility. Concentrations of power control most means of production. Concentrations of power force persons to concentrate on participating in competition and power games in order to create a social position for themselves. Concentrations of power are nourished by the illusion that competition is better than collaboration. It is necessary to collaborate and share means of production if we want to organise ourselves in as small concentrations of power as possible. 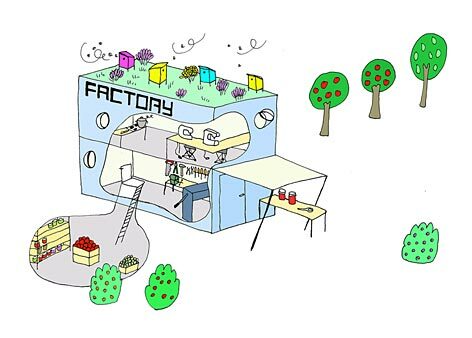 FACTORY is a system that can be used for sharing means of production with other persons. FACTORY consists of production facilities situated in different places in the world. 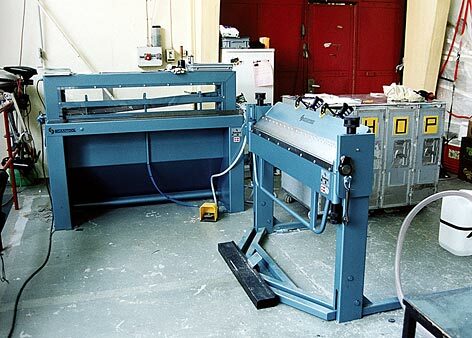 The production facilities are included in FACTORY by persons who guarantee that anybody can use them according to the function they are initiated with and within given hours and periods of time. Any person can expand FACTORY by providing one or more production facilities. Positions of FACTORY can be found in Manual for FACTORY. The manual is continuously updated at www.N55.dk/FACTORY.html. A current version can also be obtained by contacting N55. Persons who offer production facilities indicate a function and a time period for the use of the factory. Unless anything else is decided between the supplier and the user, the user delivers the work Any person can use FACTORY. Attention is directed to the logical relation between persons and the rights of persons. Persons should be treated as persons and therefore as having rights. If we deny this assertion it goes wrong: here is a person, but this person should not be treated as a person, or: here is a person, who should be treated as a person, but not as having rights. Therefore, we can only talk about persons in a way that makes sense if we know that persons have rights. FACTORY can be expanded by anybody by offering a production facility and informing N55 of the position. Formally, the production facility remains the property of the persons offering it, but they guarantee that any person can use the FACTORY according to the indicated functions. Alternatively, persons can collect and distribute information about the positions of FACTORY and set up parallel FACTORY systems. FACTORY is maintained by the persons involved. n55@n55.dk to use this FACTORY. FACTORY, proposal for Munich, Germany 2003.